(Newser) – Wisdom the Laysan albatross is "at least" 63 years old, experts say, making her the oldest known wild bird on the planet. And, amazingly, she's still hatching chicks. Last week, a worker at the Midway Atoll National Wildlife Refuge—Wisdom's home in the north Pacific—saw the mother caring for a new chick, according to a press release. And it's a feat she's managed for each of the past seven years, LiveScience notes. For comparison, most Laysan albatrosses live between 12 and 40 years, per the US Fish & Wildlife Service. Wisdom first came to the attention of researchers while incubating an egg ... in 1956. 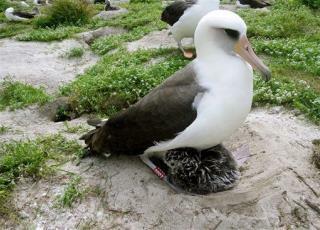 She was tagged then, and has likely raised no fewer than 30 chicks in her lifetime. How many English heart attacks will happen if the head line read "63 year old bird has baby!" She looks good for 63, doesn't look a day over 6 weeks.